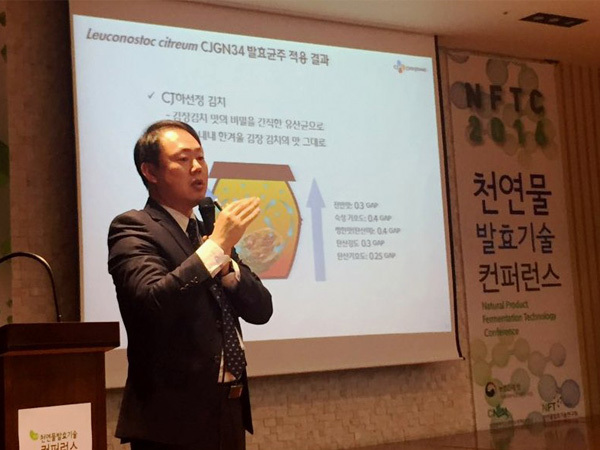 On November 21, CJ CheilJedang gave a presentation on ‘Commercializing Effective Microorganisms of Kimchi’ at the 1st Natural Product Fermentation Technology Conference hosted by the Rural Development Administration held in Suwon, Gyeonggi-do. Bong-Joon Kim, director of the Effective Microorganism Center, stepped up as the speaker for CJ CheilJedang and gave a presentation on the case study of ‘Commercialization by Developing Effective Microorganisms of Kimchi.’ He introduced the R&D process of BYO skin lactobacillus CJLP133 and intestine lactobacillus CJLP243 that succeeded in commercialization by analyzing over 3,500 kimchi lactobacillus as well as the functionality of individual strains. He also introduced the case study of applying kimchi fermentation strain CJGN34 to CJ Hasunjung Kimchi, which is separated from the kimchi freshly made in winter and maintains its deep taste of winter year-round. In addition, the conference also introduced Amorepacific’s ‘Commercialization of Health Food for Beauty Care using Green Tea Fermentation Technology’, and the Foundation of Agri. Tech. Commercialization & Transfer’s ‘Technology Transfer and Commercialization of State-owned Patent Rights.’ There was also a panel discussion among specialists for on-site application of fermentation technology, where the participants discussed the value creation of traditional fermented products with highly functional effective microorganisms and the possibility of global market expansion.